My wife Su Young Lee (we got married last month) has just published her first book. It is pretty unlikely the audience of this blog will read it, but it’s still such a great accomplishment that I can’t not crow about it. 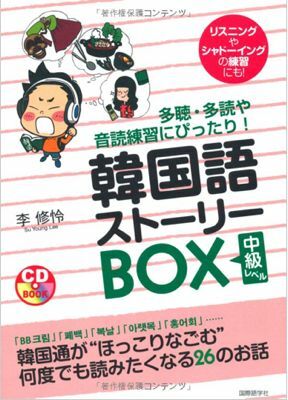 The title is- 韓国語ストーリーボクス -Korean Story BOX, and it’s basically a mid-level fun textbook for Japanese students interested in learning Korean, filled with all kinds of insider insights on Korean culture- such as the lowdown on face lotion BB Cream (I hear it’s very popular with Japanese ladies), how Japanese are loath to schedule social engagements on a whim, and other great stuff. It was published late March just after we came back from our honeymoon and has apparently nearly sold-out its initial print run of 2,000. Pretty amazing for something she started as a hobby, but soon became a very serious endeavour, as the idea mutated and the publisher was hooked. It started off as a book of fairy tales in Korean and Japanese, then became far more original content she wrote herself. Once the publisher’s galleys started arriving, the work-level went through the roof. But now it’s all done, the book is on shelves, and she (we 🙂 ) can sit back and watch the royalties pour (trickle, perhaps) in. One great thing in this book’s favour is the cultural headwind blowing from the Korean peninsula. Korean TV romances and K-pop music are pretty huge with a certain segment of Japanese; probably young ladies, though I’m far from being an expert. The Story BOX should play right into that demographic. If you are interested (perhaps you are Japanese, or you just have a hankering to read more about Korea in both Japanese and Korean) you can read more about it on her blog (in Korean!) here. Or you can buy it on amazon.co.jp here, where one of the reviewers so far said she loved the content, though was a little shocked at the ‘raw meat’ color of the pages. I don’t think it looks like raw meat though- more a striking vermilion. OK, crowing over. Back to our regularly scheduled programming (which I confess of late has been very sparse). You married! Congratulations to you and your wife! 🙂 Don’t you want to illustrate this event with a few pictures? That would be super! (if you share them privately that’s also fine). I know understand why you were so busy! Interesting she published a book. Is it self-published or did she find an editor easily in Japan? I made a book but only got one printed with some publisher, as a test, it’s cool, but without a good editor behind everything it’s really hard. Thanks Jordy- as for photos yeah that’s more a private thing, though friend me on FB and you’ll be able to see them. The book was put out by a real publisher here- after close to a year of back and forth with the editor- making alterations, fine-tuning, what have you. It started out really as a hobby, but then when the publisher bought into it, it got serious. Now she’s blogging up a storm to draw attention to it. Pretty cool. Did you have any success in sales of your book, btw? Third event? Did I mention a third event? Congratulations! Now you and SY start the REAL adventure. I hope on your honeymoon you at least got to poke around a ruined castle. Thanks David, yup we did, at least around a ruined hunting lodge anyway. Also we got to build a stepping stone bridge across a freezing river, which was probably the trip highlight. So your wife is a Korean that knows English, Japanese, and Korean?! Wow! She must be every intelligent. I am an English teacher currently living in Korea- Chungcheongnam-do province working at an elementary school. I learned Japanese in college and since being in Korea, I have picked up some things here as well. I stumbled upon your blog while trying to get back into learning Japanese- mostly Kanji and saw your blog post on Tofugu about Kanji. How did you and your wife meet? Thanks for writing! Hi Malia, thanks for the comment, my wife is very flattered you think she’s so intelligent. She did work hard at her languages, that is for sure. It’s interesting you came here from that guest post about kanji- I looked back and saw it basically said I was not hot on Japanese culture, so couldn’t get a grip on the language. I suspect you must enjoy Japanese culture a bit more than that? Everybody nowadays want to learn their own culture.but nobody does like that.but you illustrate the realities in your blog.that was so fantastic and you published your books sucessfully that was brilliant.you two getting married Congrats for that!!!. In by comments of KOREAN STORY BOOKS are more liked by others. Learning a foreign culture is always an interesting experience. Discovering it in a book is very interesting in that when you’ll go really in the concerned country you’ll have in mind together what you imagined and what you just feel. – they cost less than a flight ! Joking aside, I read it and wondered about the personality of the author. I know a little bit more now. Thanks. Congratulations to you both and on your wife’s successful book launch! Sounds like an interesting read :). First of all congrats for marriage and also for successful book launch. People have to know language pretty clearly for understanding anyone culture. And for writing something on it they more clear view about it. Congratulations! It is very sweet thing that you are writing a review for your wife’s book. Your wife’s initiative is much appreciating. Generally we all are very curious to know other people’s culture and belief but we can’t communicate for language barrier and this book will help the readers to have the knowledge of other community. books to learn Korean.Wish you a happy life. Thank you, and my wife appreciates your nice comments about her book. Good luck with your future studies! Nice, i live in brazil. I’d like to buy that box in Portuguese! !